You'll be £19.99 closer to your next £10.00 credit when you purchase A Pauper's History of England. What's this? What would English history look like from the gutter? The past is traditionally told from the viewpoint of kings and queens, politicians and pioneers. But what about the people struggling to survive at the very lowest levels of society? Surely the poor are just as much a part of our heritage? A Pauper's History of England covers 1,000 years of poverty from Domesday right up to the twentieth century, via the Black Death and the English Civil War. It uses contemporary sources creatively to give the reader an idea of just what life was like for the peasants, paupers, beggars and the working poor as England developed from a feudal society into a wealthy superpower. The author has produced a very novel alternative history. It is a powerful and serious subject but it includes humour and irreverence. An engaging book that rewards the reader. 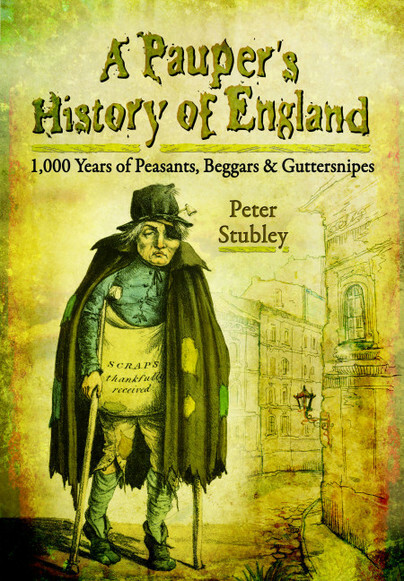 Peter Stubley has, like some historians before him, decided to take a look up from the gutter and his book A Pauper’s History of England, 1000 Years of Peasants, Beggars & Guttersnipes. This is a wonderful view from the bottom of the pile looking up at their Lordships, this is a book that looks at all those the history books forgot or simply avoided. ... Peter Stubley has researched and written a wonderful history book that really draws you in and think there by the grace of God I live today rather than then. Well written and illustrated throughout this book is of great interest to all readers and especially those that want to know more about the poor of England and how they were dealt with in history. This book covers 1,000 years of poverty from Domesday right up to the twentieth century, via the Black Death and the English Civil War. It uses contemporary sources to give the reader an idea of just what life was like for the peasants, paupers, beggars and the working poor as England developed from a feudal society into a wealthy superpower. I’m attracted to Peter Stubley’s meticulous research which conjures up the sights, sounds and smells of a compelling – and dark – part of English history. I really wasn’t sure what to expect from this book but can claim to be surprised and delighted by its content. Over the course of its 23 chapters the author really does take us through the history of England from the viewpoint of its poor, from Norman times through to the late Victorian period. The epilogue at the end brings us into the 21st century. Rather than just relate the details of the miserable lives of the poorer classes the author animates them, interviews them and has them speaking for themselves. He takes you to the period in question and sets you down – able to view for yourself at first hand their lives and issues. The chapter on the Black Death begins with you standing in the middle of a village already ravaged with plague. It is eerily quiet, bodies piled up with the smell of rot and decay amidst untended animals. It is only a short chapter but it is evocative and poignant and a credit to the author in using such an unusual, yet charismatic and beguiling writing style. In the course of our historical tour we go to Bedlam (Bethlehem Hospital – London) in the eighteenth century, we meet witches and the Witchfinder General himself – Mathew Hopkins. We take part in the Peasants Revolt of 1381, visit the Workhouse, the Monastery, Bridewell and the Fairground amongst much more. If you like your history well researched, and your reading scholarly accessible and above all absorbing, then this book should be on your shelves. A fantastic historical journey in the company of a knowledgeable guide. This evocative read gives an idea of what life was like in the gutter, whether joining the Peasants' Revolt of 1381 or enjoying a gin-soaked night of Georgian debauchery. Peter Stubley is a crime journalist and historian. He was born and raised in the north of England but lives in London. This is his third book.